Pai Ping-ping is a well-known television personality on Taiwan. A decade ago, she was an enthusiastic supporter of the DPP as a political party, and of Lee Teng-hui and Chen Shui-bian as political leaders. In April 1997, Chen Ching-hsing, Lin Chun-sheng, and Kao Tien-min, a trio of Taiwan independence thugs, Deep Green supporters of the DPP, kidnapped Pai Ping-ping’s 17 year old daughter Pai Hsiao-yen, and held her for ransom. It is said that “A fool who persists in his folly will become wise.” Many supporters of Taiwan independence are now former supporters of Taiwan independence. By persisting in their folly they have become wise. China, including the Taiwan region of China, has never acknowledged the right of ordinary citizens to keep and bear arms. Many societies, as divergent as Afghanistan and Switzerland, have cultural traditions that acknowledge this natural right of individual human beings. China, it pains me to say, has not been among them. Pai however, has become very wise indeed. Not only has she forsaken Pan Green ideology, she now explicitly champions the right to keep and bear arms. That someone like Pai would have the uncommon sense to recognize that armed self-defense is a fundamental human right, is immensely encouraging. This is particularly true in the wake of the 32 shooting deaths at Virginia Tech, when many Americans have lost sight of this simple truth that the Founding Fathers considered self-evident. One can only hope that Pai’s conversion to champion of the right to keep and bear arms is the first of many to come, not only in the Taiwan region of China, but in China as a whole. One can only hope that Pai’s conversion is not merely the first of 23 million, the Chinese population on Taiwan, but the first of 1.3 billion, the population of China as a whole. The Presidential Pardon / Furious Backlash! President Chen Shui-bian intends to issue a nationwide presidential pardon. As soon as the news got out, victims’ families reacted angrily. Pai Ping-ping, whose daughter Pai Hsiao-yen was murdered ten years ago, angrily denounced the proposed pardon as callous indifference to the feelings of decent, law-abiding citizens. She also urged President Chen to reconsider, pointing out that if Chen Ching-hsing, her daughter’s murderer was still alive, her tax money would be supporting him for the rest of his life. 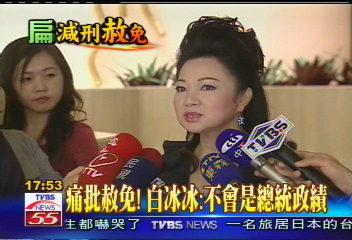 Although her tone was moderate, the content of Pai Ping-ping’s statement was direct and sharp. She occasionally choked up as she attacked President Chen’s nationwide mass pardon. On the 10th anniversary of Pai Hsiao-yen’s kidnap/murder, Pai Ping-ping’s mood remains as intense as back then. The sense of helplessness felt by crime victim family members can only be imagined.